The California National Guard is a branch of the military with the motto, “Integrity First.” But some members of the Guard point to problems over several years that have eroded morale in the organization. In a joint investigation with KNBC-TV in Los Angeles, NBC Bay Area News has uncovered a questionable and potentially dangerous flight under the Golden Gate Bridge in June by five California National Guard helicopters. Some people say it was a reckless and risky decision, but it’s what happened after the flight that members of the Guard say exposes the real problems. Exclusive video and photos obtained by NBC Bay Area News and KNBC show an ill-advised helicopter trip that originated at Moffett Field. The video shows a gray helicopter going under the Golden Gate Bridge. The photos show four other helicopters trailing behind it. According to sources, the helicopters are HH-60 pave hawks with protruding refueling probes, which belong to the California National Guard and are used by Moffett Field’s 129th Rescue Wing. The video and pictures also show that the bridge is shrouded in fog, and members of the California National Guard say that foggy morning produced a clear example of high-ranking hypocrisy. Air Force regulations require a minimum cloud ceiling of 700 feet. The top of the Golden Gate Bridge measures 746 feet and the distance between the water and the roadway is 246 feet. The photos appear to show the fog sitting well below the Air Force requirements for safe flying in non-emergency situations. Click below to see the raw video. A veteran military helicopter pilot with flying experience in Afghanistan and Iraq watched the video of the flight under the Golden Gate Bridge and agreed to speak with NBC Bay Area’s Chief Investigative Reporter Tony Kovaleski on the condition that his identity is disguised because of fears of retribution. “Why did you agree to this interview?” Kovaleski asked the pilot. “Definitely not prudent,” said the pilot. NBC Bay Area and KNBC have learned that the decision to go under the bridge was made by two top senior leaders at the 129th Rescue Squadron. A document obtained by the television stations show that Major Thomas Keegan and the unit’s commander, Major Matthew Wenthe, were the two pilots in the lead helicopter that called the shots during the trip. Sources say it was a non-emergency flight rewarding 40 members of the California National Guard, with 20 pilots and crew leading the way. But sources say the flight was officially described by the Guard’s leadership as a “familiarization trip” for members of the 129th Rescue Wing to learn the terrain around San Francisco. NBC Bay Area and KNBC could not determine which kind of flight it really was. But NBC Bay Area and KNBC have confirmed that the Guard did not discipline Keegan and that Wenthe received only a written reprimand. The television stations have also confirmed that in the weeks following the flight under the Golden Gate Bridge, both Keegan and Wenthe received promotions to Lieutenant Colonel. Contrast that with what happened to Lieutenant Colonel Rusty Henderson from Moffett Field’s 129th Rescue Wing. Henderson has served the in United States Military for nearly 20 years, including 10 years with the California National Guard. 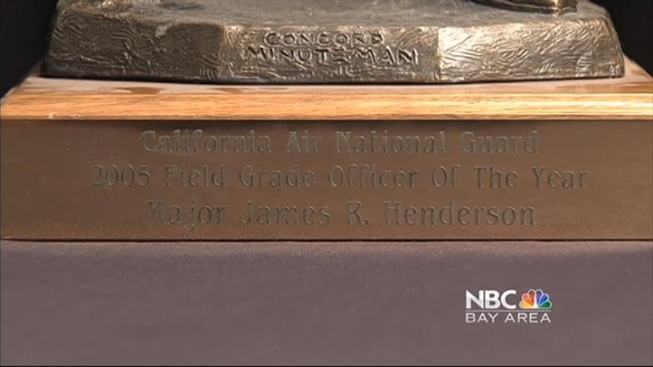 In 2005 Henderson was honored as the Field Grade Officer of the Year—one of the highest awards for a Guard member with a field grade officer ranking—beating out 1,000 people for the honor. “That is correct,” Henderson said. “Will you get nominated for this award in 2012?” Kovaleski asked. “Not a chance,” Henderson said. “I wish I had a good answer for you,” Henderson said. Henderson was released of his active duty tour on May 30 of this year. He says he was fired from his fulltime position for standing up for one of his airmen who he believed leadership was wrongfully discharging from his post. Henderson believes he was ultimately relieved of his command for challenging leadership—a stark contrast to the promotions that followed the flights under the Golden Gate Bridge. A still-secret report is also highly critical of the culture in the California National Guard. In May 2011, two National Guard members from other states led an independent investigation into problems in the California Guard. NBC Bay Area and KNBC obtained a copy of the draft report co-authored by those two investigators—the content of which was confirmed by Chief Warrant Officer Ronald Petty of the Oklahoma National Guard. The report was originally requested by the California Guard, paid for with tax dollars and ordered by the National Guard Bureau in Washington, D.C. In a February letter to the National Guard Bureau Major General Baldwin—the commanding officer of the California National Guard—asked for a copy the report “so as to identify opportunities to improve” Equal Opportunity and Equal Employment Opportunity programs within the Guard. But 18 months after the report was finished, the California Guard’s leadership has confirmed it still does not have a copy. Sources say the fact that leaders of the California National Guard have not seen the contents of the report exposes a culture of dysfunction. Kovaleski spoke with Petty—one of the investigators and co-authors—at his home in Oklahoma City, and asked him why he decided to speak out. “You found some significant problems,” Kovaleski said. “I am sure they are,” Petty said, referring to the 14 members of the California National Guard he interviewed during his investigation. Petty found that sexual harassment and a hostile work environment are common in the California National Guard and that the mediation process in the California Air National Guard is seriously flawed. The NBC Bay Area and KNBC joint-investigation included meetings and interviews with nearly two dozen men and women from the Guard who claim say they have witnessed sexual harassment, racism and retaliation. All nine of the men and women of the California National Guard who spoke on-camera say they are frustrated with the current state of the culture, and believe the information contained in the report co-authored by Petty embarrasses the National Guard. The California National Guard said that it cannot comment on the report co-authored by Petty because it has not yet received the report. Petty says he believes there has been some movement from leadership recently and the California Guard may finally be serious about cleaning up problems. In February of this year, the state senate confirmed Major General David Baldwin as the California National Guard’s Adjutant General after being recalled from Afghanistan and appointed to the post by Governor Jerry Brown in April 2011. “I have a mandate from the Governor to change the culture of the organization,” Baldwin told the Senate Rules Committee in Sacramento during the February 15 confirmation hearing, pledging to fix deeply-rooted problems dating back several years. Kovaleski asked the group of nine men and women of the California Guard who spoke on camera if Major General Baldwin kept his promise to fix the issues they have raised for years. Through his spokesperson Major General Baldwin told NBC Bay Area and KNBC that he has a great story to tell, but over a period of three weeks, declined to answer questions on camera—declined to answer the concerns of California Guard members who wonder why risky flights under the Golden Gate Bridge are accepted and standing up for a better culture is not. NBC Bay Area and KNBC do intend to ask the tough questions to General Baldwin in a public place in the weeks ahead. Click here to see Part 1 of "Behind the Gates of the Guard," a joint-investigation by NBC Bay Area News and KNBC-TV into claims of a toxic culture inside the California National Guard. If you have a tip for the Investigative Unit, email theunit@nbcbayarea.com or call 888-996-TIPS (8477).